As 2015 rolls along, Marvel is moving closer to their universe-altering miniseries Secret Wars, which hits comic book stores in May. You’ll have to read the series to find out specifically what goes down, but it’s been touted as Marvel’s biggest event yet and will change the Marvel universe as we know it. However, it won’t be the only huge publishing milestone that the House of Ideas has coming up in May. As all hell breaks loose in Secret Wars, Marvel will also be changing the status quo by bringing something completely new to the table this summer: an all-female team of Avengers. Marvel announced today (hat tip to Mashable) that they will introduce their first all-women team of Avengers in the new series A-Force. 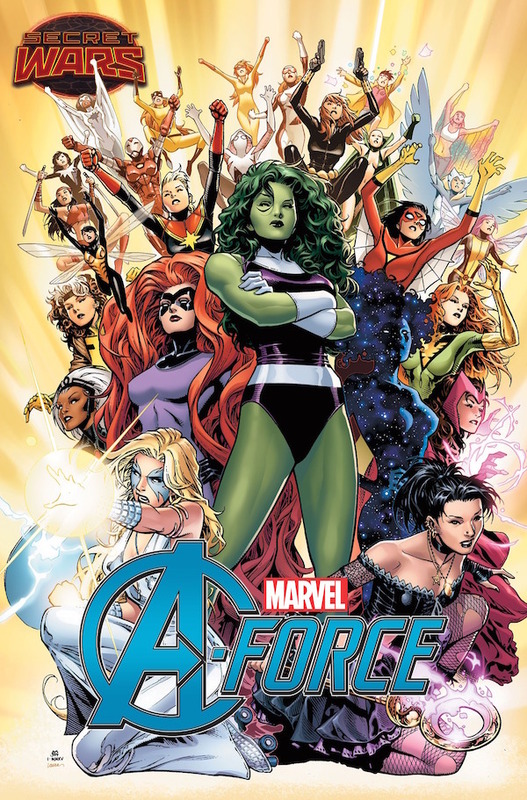 The lineup will consist of She-Hulk, Medusa, Dazzler and many other heroes from around the Marvel universe, including a new one named Singularity, who is described as “cosmically powered.” Although the specific details of their formation are unclear, these women will “take over and lead the way” in May when the older Avengers teams are disbanded. It has yet to be confirmed, but these could be the “All-New, All-Different Avengers” that were teased last month. A-Force will be co-written by G. Willow Wilson, who introduced new Ms. Marvel Kamala Khan last year, and Marguerite K. Bennett, while Jorge Molina will handle art duties. While this isn’t Marvel’s first book featuring a female-led superhero team (it’s actually their fifteenth, the most recent being the female mutant-led X-Men), the above team certainly looks like they’re a force to be reckoned with…sorry, I had to do it. Marvel has also been making strides with appealing to their female fanbase and publishing titles that put their superheroines in the spotlight, such as the previous mentioned Ms. Marvel, Captain Marvel, She-Hulk, Storm, Black Widow and several others. The artwork above might be exaggerating the team’s numbers slightly, but it looks like most of Marvel’s female superheroes will be fighting alongside each other. Scarlet Witch, Spider-Woman, Black Widow, Rogue, a lot of the mainstays are there. There also seems to be several heroes that hail from universes aside from the main 616-continuity, like Spider-Gwen, an alternate universe Gwen Stacy who became Spider-Woman. Because of the fallout from Secret Wars, it looks like there will be heroes from other universes teaming up alongside the 616 heroes, making the A-Force not only unique for being all-female, but for not discriminating based on what universe you’ve lived in. Wilson said in the statement that they’ve “purposefully assembled a team composed of very different characters — from disparate parts of the Marvel U, with very different power sets, identities and ideologies,” and that together they will answer questions together like “What would you sacrifice to succeed?” and “What is being a hero worth?” Needless to say the A-Force marks a major step forward, not just in terms of impact on the Marvel universe, but for female representation in comics. Now one has to wonder if DC might one day form an all-female Justice League in response.